Wild-living monkeys spend the majority of their time searching for food and consuming it. Foraging activities take up the largest part of their day, followed by play and social grooming. Foraging activities provide opportunities for primates in the wild to interact with one another and work together to obtain food. Foraging affords an opportunity for exercise and muscle building, which keeps the wild-living monkey’s caloric intake and energy expenditure ratio in balance. Working for food, or foraging, is mentally stimulating for our captive-living primates as well. Providing opportunities for our monkeys to search out and forage for food helps to reduce boredom and encourages healthy movement and activity. 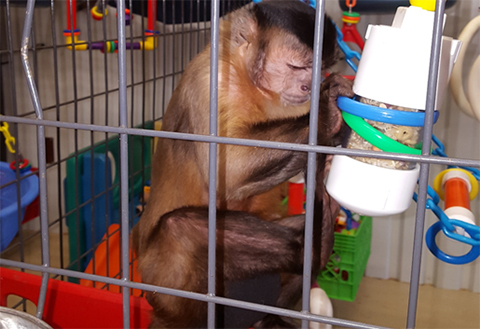 Anything we can do to make our monkeys’ food more difficult to obtain and consume stimulates higher order thinking skills such as problem-solving and strategizing. Placing foraging devices high in the enclosure or outside it encourages climbing, stretching and reaching. I spent the last part of this year trying to not only run a “Hospice-care” for my beloved Chewie, but to also try to prepare myself for loosing him. I hope after reading this “Special Topic” and seeing the photos, that you will know (without a doubt) it was truly a wonderful experience to have him in my life. I am very thankful for this set of photos. We had so much fun together. He loved to have his special “brush-you” time during each show and of course his very special “mirror” time. 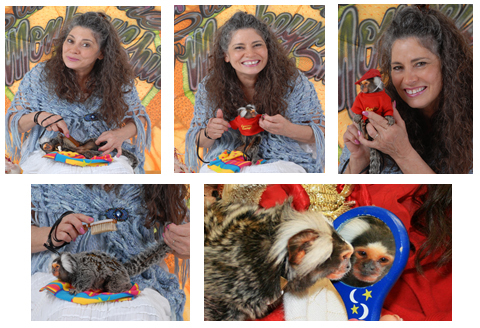 Even with his smallness he knew he was the “special star” of the SunShine MonkeyShine’s presentations. I must also add that he knew he was the boss of the troop of Capuchin monkeys as well! He grew to love my troop of monkeys and I feel that his love for the troop made him wish to stay with us as long as he possibly could. Chewie was not always called my little monkey but I did know him for his entire life. The years that we were with each other were so very special as I am sure you can see from the photos that I am sharing. When he was with us for our presentations, he was chosen by many as their favorite monkey that was there for the special event.